NickALive! : Nickelodeon USA Digitally Premieres Episode From Upcoming Preschool Series "Sunny Day"
To celebrate Nickelodeon USA starting to premiere and show Sunny Day on Monday 21st August 2017, NickJr.com has digitally premiered the first episode of Nick's brand-new animated preschool series, "Friendship Day", which you can watch here on the networks official Sunny Day show website, nickjr.com/sunny-day! Sunny Day is a brand-new musical, comedy series that features a 10-year-old master hairstylist and salon-owning entrepreneur named Sunny. With the help of her best friends, Blair, Rox, and her adorable pup, Doodle, Sunny can solve any problem that arises in her seaside town of Friendly Falls through determination, self-expression, and a positive attitude. Above all, Sunny always uses her styling skills in creative ways to be a true leader and inspires individuality in every preschooler. When adventure calls, Sunny sets out to save the day with her can-do attitude, tricked out Glam Van, best friends Rox and Blair, and Doodle by her side! The characters in the series celebrate individuality and self-expression, while the show's social-emotional curriculum promotes leadership, innovative thinking and teamwork. Each episode of Sunny Day also features a unique digital extension on NickJr.com and the Nick Jr. App where kids and their parents can watch fun, live-action hairstyle tutorials that are tied directly to each storyline and narrated by Sunny. The voice cast of Sunny Day includes: Lilla Crawford (Into the Woods) as Sunny; Elan Luz Rivera as Rox; Taylor Louderman (Peter Pan Live!, Frozen on Broadway: First Look) as Blair; and Rob Morrison (Peg+Cat) as Doodle. The first season will also include celebrity guest star appearances including Ashley Parker Angel (O-Town), Lance Bass (NSYNC), Kether Donohue (Grease Live, Pitch Perfect), Christopher Fitzgerald (Waitress), Adam Jacobs (Aladdin) and Shanice Williams (The Wiz Live!). In "Friendship Day" (#101), Doodle thinks Sunny has forgotten him on Friendship Day. He goes out to find a new friend but is taken by the Dog Catcher Scratch. Sunny must get Doodle back! 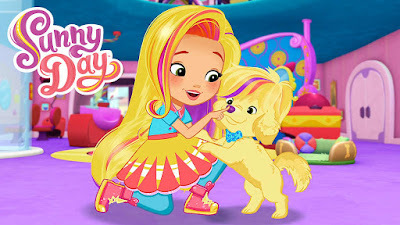 NickJr.com's official Sunny Day website also features a video of the official Sunny Day theme song, and a super "Style File" video featuring a tutorial on how to make a fabulous friendship braid just like Sunny's! Leading up to the shows debut, NickJr.com and the Nick Jr. App will be rolling out a selection of full-length episodes of the show, plus short-form content online beginning June 5th. Additionally, a new online game "Smiling and Styling with Sunny", which will let players style and color hair plus paint and decorate nails for the residents in Friendly Falls, will be debuting on Friday 4th August 2017 on NickJr.com and the Nick Jr. App. Produced by Silvergate Media (Peter Rabbit), Nickelodeon has picked up the series for 40 episodes (two seasons of twenty 22-minute episodes). Rusty Rivets Poland | Meet Ruby | Nick Jr.
Rusty Rivets Poland | Meet Rusty | Nick Jr.